Alex (Denholm Spurr) is on a date with Nick (Kane Surry) and it’s going quite well. Nick has beautiful eyelashes. Nick also has HIV. Alex freaks out and heads for the nearest bathroom window, in which he gets stuck. The next day, Alex has an audition for a new play, written by Barney (Jonathan Blake) and based on his old boyfriend Eric who died from AIDS many years ago. It turns out that Alex looks strikingly like Eric. To get the role, Alex tells Barney that he has direct experience with HIV, as his boyfriend, Nick, has recently been diagnosed with it and he is caring for him. Irene (Charly Flyte) is one of the nurses who looked after Eric all those years ago, at a time when the stigma around HIV was far more prevalent than today. She once made him a mojito whilst he was in hospital, crushing the ice with a defibrillator. We then meet Nick, who tells us first-hand about living with HIV, as he curses the ex-boyfriend who led him to sleep with someone else and contract the virus. Finally, we meet Barney himself who awaits the premiere of his new play. The story is narrated through four central monologues, with occasional interaction between the characters. Patrick Cash’s storytelling is sublime. Poetically constructed, craftily integrating the narrative of the story with the description of the surroundings; details right down to the bit of spinach which falls onto Alex’s chin as he gracefully attempts to munch on a canapé whilst chatting with Elton John. The art of successful storytelling is the ability to create a clear picture and journey in the minds of the audience, and Cash does so with an exquisite and thoughtful attention to detail. The writing is wholly supported by Luke Davies’ gentle direction, which keeps its audience mesmerised with its pace and emotion. It ebbs and flows with humour, pathos and moments of human nature. With four performances one after the other, it would be easy to have a stand-out, but the contrast of character and delivery means this is not the case. Denholm Spurr is adorable, tearful and completely loveable as Alex, as he talks through his embarrassing tinder date and tears through the revelation of a fear of HIV. Charly Flyte is fierce in persona and contrasts this wonderfully with the vulnerability of her situation; a Nurse in care of an HIV patient at the start of the AIDS epidemic. Kane Surry shows the hardships of a man breaking down from the thoughts that no one will ever see past his disease and Jonathan Blake – one of the first people diagnosed with HIV in the UK – is the heart at the core of the story. The combination of direction, writing and performance are harmonious in this production. So much so that my heart rate became synchronised with the beat of the narrative, breathlessly rushing to climax in one of the most gorgeously choreographed love making scenes I have seen on the stage. I’m a sucker for simple storytelling, and this is storytelling at its best. 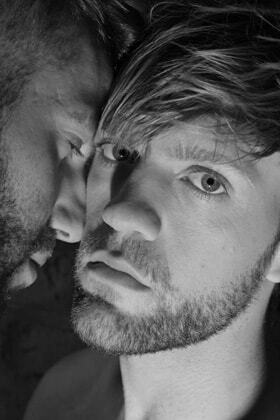 fter a critically acclaimed launch at the end of 2016, Dragonflies Theatre’s new production returns in 2017, exploring HIV amongst gay men through a series of interwoven stories. Writer Patrick Cash and director Luke Davies continue their work, including show The Clinic and The Chemsex Monologues, in bringing important queer stories to the UK stage with The HIV Monologues, which stars inspiration for the film Pride and one of the first people to diagnosed with HIV in the UK Jonathan Blake.